Another major player in preserving open space in Forsyth County is the Piedmont Land Conservancy (PLC), a nonprofit land trust that serves Forsyth County and eight surrounding counties. 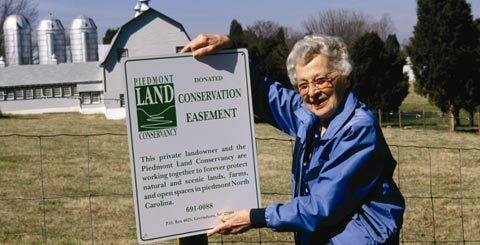 The mission of the PLC is to protect natural and scenic lands, farms and open space in Piedmont North Carolina to enrich the quality of life for Piedmont communities and for future generations. To date, the PLC has protected approximately 275 acres of land through conservation easements at 11 locations throughout the Forsyth County including: Camerille Farms in the Mill Creek Basin; the Emily Allen Wildflower Preserve; the Friedburg Marsh; the Haw River Headwaters; Spach Farm located off Silas Creek Road; Black Walnut Bluffs; Black Walnut Bottoms; the Myers Tract ; Muddy Creek Bluffs; the Apple Orchard (the previous five sites are in or near Bethania); and the Martin Mill Muddy Creek Floodplain.